Shared rides in premium vehicles. 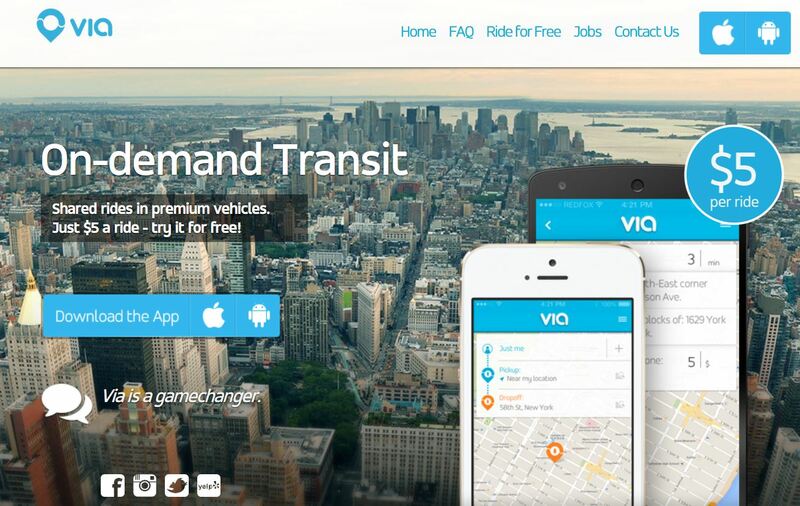 Via is a smarter way to get around New York. Take a shared ride in a premium vehicle driven by a professional chauffeur — it’s just $5 when you prepay. Try the on-demand transit app that is smarter than the subway, better than the bus, and cheaper than a taxi. Use the code “app” to get your first ride free! • Via operates between 6:45am – 9pm on weekdays. • Ride anywhere within our service area for the same flat fare: http://ridewithvia.com/#map. • We currently serve much of New York City, including the Upper East Side (UES), Upper West Side (UWS), and Midtown Manhattan. Stay tuned! We’re quickly expanding our NYC service area. When you request a ride, our powerful algorithm matches you with a car going your way. We’ll pick you up on your corner in about 5 minutes. Via makes sharing a car with other passengers seamless and is nearly as fast as a taxi. We’re so confident you’ll love Via that your first ride is free! We only ask that you rate our app. Keep riding for $5 a ride when you prepay. (Prepaying is easy – just buy Ride Credit in your app.) Without prepayment, rides are $7. We look forward to having you ride with us! Use the code “app” to get your first ride free!